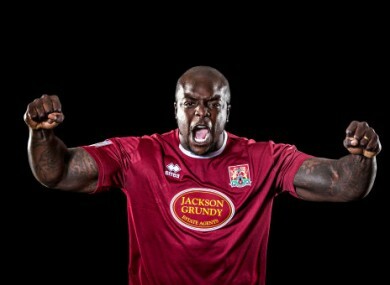 Akinfenwa pictured in his days at Northampton. ADEBAYO AKINFENWA IS not your typical striker. Weighing in at 16-and-a-half stone with a career spent sampling the very best the lower English leagues have to offer, he is an unlikely FA Cup hero. And yet he is the man to whom Wimbledon will turn to when Liverpool come to town tonight. Far from the slighter, athletic strikers who light up the Premier League each week, Akinfenwa, who enjoys cult status among football fans as the strongest player in EA SPORTS FIFA 15, is of a different breed. He claims to be able to bench press 180 kilograms and talks of activating his own special talent – ‘Beast Mode’ – when he comes face-to-face Brendan Rodgers’ men at Kingsmeadow Stadium. Yet Akinfenwa – who has played for 13 clubs, including Lithuanian side FK Atlantas – shuns the suggestion that he has a point to prove to those who claim that he is merely a ‘big man’, insisting that he embraces the criticism and uses his size to his advantage. “The simple answer? No,” he replies when asked if he hopes to settle any scores. Despite the presumed gulf in class between the two sides, Akinfenwa is hopeful that the magic of the FA Cup can help his team spring a shock. He continues: “You can’t sugarcoat it: we’re a League Two club, I’m a League Two player and they’re a Prem [team]. While the Crazy Gang may have come and gone, Akinfenwa hopes that ‘Beast Mode’ will earn a similar place in Wimbledon folklore on Monday. Email “Liverpool have to deal with FIFA 15's strongest player when they face AFC Wimbledon tonight”. Feedback on “Liverpool have to deal with FIFA 15's strongest player when they face AFC Wimbledon tonight”.